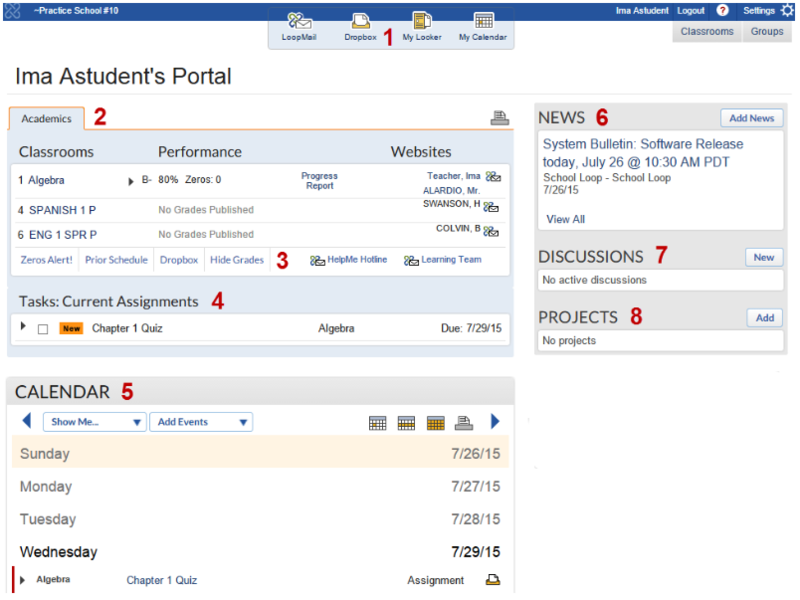 In addition to many of the same tools and features available on staff portals, the student portal is populated with assignments and grades posted by their teachers. The student's portal has the same icons as staff and parent accounts, but also includes the Dropbox icon, where a time/date stamped archive of every file submitted online is maintained. Each file is stored on School Loop's system and may be downloaded by the student. The last submitted version of a file is the only one archived. All of the grades and progress reports published by the student's teachers are located here. Recent scores, zeros and a trend graph are available by clicking the arrow next to the grade. Links to the classrooms are available by clicking the course name. There you will find course related information, including this week's assignments, curriculum, the classroom locker and calendar. There are also links that allow parents to quickly send a LoopMail message to one or all of their student's teachers. An Attendance tab will be displayed next to the Academics tab if your school exports attendance data to School Loop. The Attendance feature displays a Student's absences and tardies for the current week by period and/or by full day. Click the Attendance tab to see this. Click the All Attendance button to view all attendance data for the school year. Click the Show/Hide button to see a description of what your school's attendance codes mean. You can click Zeros Alert to get a special report with details about any assignments with a zero score. Prior Schedule link will display any classes the student has dropped or been transferred out of during the current school year. The Dropbox button allows you to see any files that your student has turned in for their assignments. The Show/Hide Grades button allows you to show or hide course averages on your portal page. Displays any current assignments. Students can check-off completed assignments. Every assignment published by the student's teachers appears in the student's calendar. Other events in the calendar can include events from groups, school-wide events and personal events published by the student. The calendar has icons for the day, week and month views and filters to narrow the types of events displayed. Assignments on the weekly calendar also display a "Turn In Work" icon for submitting work to their teachers. Plus Grade book Users - files cannot be submitted via the Turn-In-Work link for Calendar-Only assignments. Just like staff portals, this section of the student portal shows the current replies to discussions in which the student is participating. All news published for the student appears in this section of their portal. The News icon at the top of their portal is an archive of all news published for the school year. If a student belongs to a group, they can view a list of the current group projects or start one on their own. The optional Custom Data feature displays information determined by your school. They can choose to display specific student information such as library fines, lunch balances or anything else they deem important. This information is determined individually by each school and is displayed at their convenience.